This mainly applies to people who've had a Straight Talk BYOP SIM before they announced LTE activation. That was around 2-3 months ago. I bought a ST SIM when I first got my Nexus 4, which isn't compatible with LTE as we all know. I've had my shiny new Nexus 5 for a few days and just got around to figuring out how to get LTE enabled on my ST #. It was STILL showing the H (for HSPA) even though the Nexus 5 can utilize LTE. I started by using live help on Straight Talk's website. I was going to copy and paste the conversation with the representative, but closed the window too soon. They answered very quickly without issue and said I needed to buy an LTE compatiable BYOP SIM. Luckily I had a spare new ST SIM around. It was an old one from March so my impression is that any unused ST BYOP SIM will work, old or new. Next I logged into my account on straighttalk.com and transferred my service to the new SIM. Swapped out the old micro-SIM with the new and now have LTE after changing my APN to the new "tfdata" settings. It was an instant transfer to the new SIM, so there was no waiting. I was just about to post a step-by-step FAQ, but I'll just tack this onto your thread. 1. 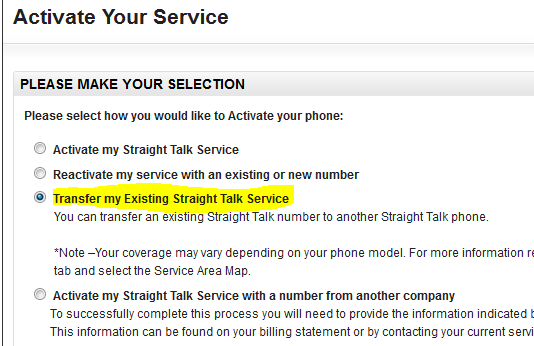 Log into your Straight Talk account and select Active phone or SIM Card from the Account Options column on the left. 2. You'll see a screen like this; select Transfer my Existing Straight Talk Service. 3. 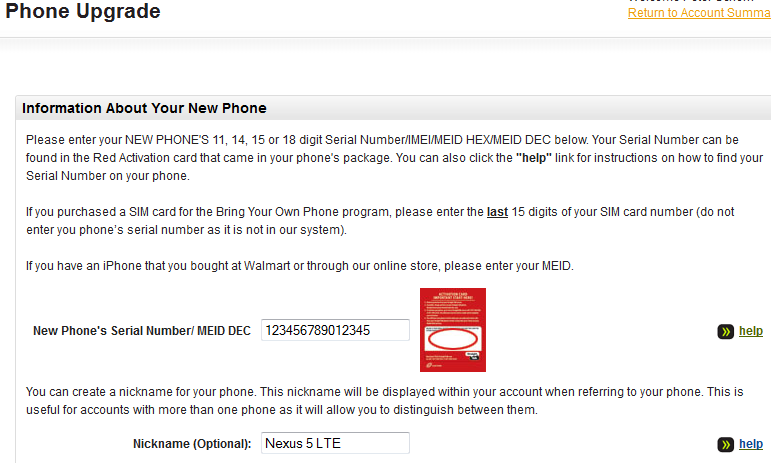 Enter the serial number from your new SIM's activation sheet and select which CURRENT PHONE you're discontinuing (i.e. the SIM card you were using, probably transferred over from your Nexus 4 if you're like me) which will transfer your phone # to the new SIM. I have Straight Talk (on Verizon) on a Straight Talk Huawei H881C. Will this work to transfer service to a Nexis 5? LTE would be awesome, but I would accept 3G. The issue is I need a faster phone. Slightly off topic, but is the process similar on Net10? I'm not sure it would be as instant since you're going from CDMA service to GSM, but otherwise it shouldn't be a problem since you're just transferring your service to a different phone. Straight Talk micro-SIMs are only $7-8 on walmart.com. If it were me I'd do it as soon as I got the SIM in the mail. Please let us know how it turns out if you decide to switch. Straight Talk and Net10 are owned by the same parent company. It wouldn't hurt to assume that it works the same way as ST since the SIM cards are so cheap (just try it), but you could call customer service or use their live chat to ask if they will enable LTE on your line. They may be able to do it from their end or they'll just tell you to get an LTE compatible SIM, which is what ST told me. I didn't buy an LTE compatible SIM - I had an unused SIM that I bought back in March of this year and it worked fine. In other words, I wouldn't worry about finding a SIM that's labeled LTE compatible. Thanks! I figured it would be similar since the 2 companies are owned by the same parent company. I don't have my new Net10 SIM yet, but I clicked through the process and it is pretty much the same as Straight Talk, just with a slightly different menu format. going to get my new SIM enabled for my Nexus 5 today, and make the switch to LTE. Once I transfer service to the new SIM, will I be able to toss the new SIM into the Nexus 4 and not experience any issues? It won't be a problem, but go ahead and put your current SIM in the N5 and see if your phone picks up an LTE signal. If it shows up then there's no reason to transfer. I only say this since the poster above me apparently didn't have to transfer his/her number to a new SIM card, for whatever reason. Look at your APN settings in your N4. What does it say under "APN"? I went from a Nexus 4 to a 5 this week on Straight Talk TMobile. I used the new micro sim for tmobile from Straight Talk's website. When I walked outside of work today(I work in a black hole for service) and looked at my phone to see if it switched to HSPA+ yet and it read LTE! I quickly ran a speed test and it hit 17mbps down and 7ish up(I usually pull 10-11mbps down and 1.5ish up on HSPA+)! It didn't finish the upload test and all subsequent tests fail the upload portion 90% in. It says "network error" every time. Ever since work earlier, my phone has been on LTE. It only gets 1 bar usually but driving around town I OCCASIONALLY get 3-4bars. Otherwise it seems stuck on 1(not literally but it's always 1-0bars). Data works, SMS works, MMS does not. Doesn't work when I turn off the LTE antenna either(via *#*#4636#*#*). It worked in the N4. I used the same APN settings as the N4(I'm just stating this, not begging for help). 3-I'm in a STRONG TMobile LTE area and I only get 1 bar usually. Any other tmobile guys getting LTE suddenly? I can't find ANYTHING on getting LTE from Straight Talk on the TMobile sims. I transferred my virgin mobile number to straight talk and it only took about 30 minutes.